"Different? I don't want to be different. I want to be as I am, as I was born, as I was meant to be." Film noir usually drives on the right side of the road, but there's always some good cinematic mileage to be had by transferring a tried-and-true genre to a new location. 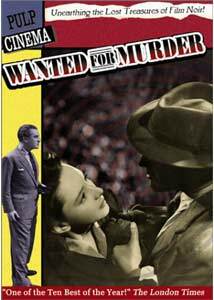 Wanted For Murder takes many of the Hollywood conventions of the 1940s and moves them to London, where, as is so often in the movies, a serial murderer is on the loose. We're with both the killer and the police in pursuit of him; rather than being a whodunit, this is a cat-and-mouse tale of Scotland Yard's ingenious efforts to keep up their reputation of always getting their man. Anne (Dulcie Gray) is off to meet her beau, Victor (Eric Portman), at the Hampstead Heath fairgrounds, but en route a fellow on the underground starts chatting her up—he's a genial sort, and so what might seem creepy from someone else is rather charming with him. His name is Jack (Derek Farr), and he's seen Anne before; he's a bus conductor, and before he was transferred, she traveled on his line every day to work. The good news for Jack is that Anne is obviously taken with him; the bad news is that she's not breaking off her date with Victor. Ah, but there's more good news for Jack: their train gets stuck, so he can make conversation with Anne for another hour or so. When finally their train arrives at the fairgrounds, Victor is absolutely apoplectic, and Anne tends to his tantrum without so much as a goodbye for Jack. We soon learn, though, that more is eating at Victor than the prospect of being stood up by a pretty girl. Victor's dear departed father was affectionately known as the Happy Hangman—he was Queen Victoria's chief executioner, and apparently took a bit too much relish in performing his duties, so much so that he earned a posthumous spot in the Chamber of Horrors at Madame Tussaud's. (One of the highlights of the film is Victor working out some Oedipal anxiety by savaging Dad's wax statue with his umbrella.) It turns out that Victor has gone into the family business in the most gruesome way—he's the strangler tormenting the young women of London, with six murders to his name already, and we know that it can't be too long before poor Anne is in the crosshairs. Suspicion comes Victor's way early on, and much of the movie is the elaborate dance between the serial murderer and the law; in this respect, Wanted For Murder offers some early versions of motifs that will become familiar decades later in movies like Se7en and The Silence of the Lambs. As the copy on the back of the DVD case suggests, there are a number of parallels between this movie and Strangers on a Train: a killing at an amusement park; a murderer rowing his prospective victim to an island, where he intends to strangle her; a psycho killer with some serious issues concerning his father, now living with and protected by Mommy. But this film preceded Hitchcock's by five years, so issues of influence are unclear; though in a couple of shots, Eric Portman is shot so much like Robert Walker is in Hitchcock's movie that it's hard to imagine that Hitch hadn't seen this. Wanted For Murder is notable also for the fact that one of its credited screenwriters is Emeric Pressburger, who, in collaboration with Michael Powell, made such landmark motion pictures as The Red Shoes and Black Narcissus. The most familiar face in the cast belongs to Stanley Holloway, who was such an impressive Alfred P. Doolittle in My Fair Lady—here he's second in command at Scotland Yard on the investigation, assisting Inspector Conway, played by the dashing Ronald Culver. Maybe it's the period, or that British homicide detectives are different from American ones (even if only in the movies), but not even the crease on Culver's impeccable pocket squares are out of place by even the slightest iota. It's a tightly told story, and comes to a reasonably satisfying climax. The narrative is a little bottom heavy, and early on especially it's a little rough to puzzle out just where we're headed and who we should be following; and there's a great kinetic energy to the final segment of the movie that's missing from much of what precedes it. That is, there are a few too many scenes of the gentlemen of Scotland Yard mulling over the evidence while sitting at their desks—the film was based on a stage play, and perhaps these are the remaining vestiges of the source material. But the pleasures along the way are numerous, and the movie is sure to hold your attention. Image Transfer Review: The DVD case informs us that this is a new digital transfer from an archival 35mm negative, but the mind reels when considering just how bad this must have looked before. The negative must be in desperately poor quality, as scratches, pock marks and bacterial erosion abound; on occasion the resolution is so poor that nearly the whole screen goes grey. Still, the many location shoots are fascinating for their portrayal of postwar London. Audio Transfer Review: The level of hissing is so high as to be downright unbearable from time to time, and it's a cruel twist of fate that the interference seems especially bad during scenes of exposition. The dynamic level of the mono track seems even more limited than other films of the period, and hence there's a good deal of buzzing, especially in the high registers or when the characters raise the volume of their speaking voices much above the most genial conversational level. Extras Review: The original trailer is a treat, but gives away too much of the plot; it's heavy with scenes from the movie's last half hour. Twenty-five still photographs from the set are a nice addition, but it's unfortunate that the generous number of chapter stops can be accessed only from the DVD menu, and not via remote control. A nicely honed British film noir that has been largely neglected, this is a welcome arrival on DVD, though it's a shame that the picture and audio quality have been so ravaged by the years.